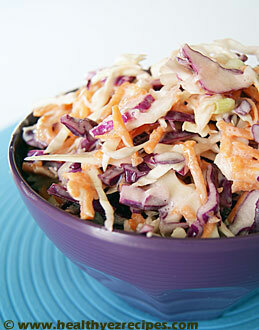 No outdoor meal such as a picnic or backyard barbecue is ever complete without a bowl of coleslaw. 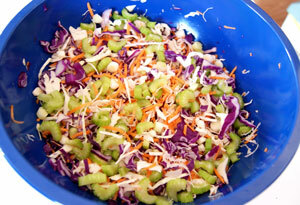 There are so many different recipes for coleslaw, all with different combinations of vegetables and dressings. But all slaws begin with cabbage in a vinaigrette or creamy dressing. Then it's just a matter of adding whatever you please or whatever you happen to have in your fridge, from carrots, celery, onion, peppers or snow peas. Use the coleslaw recipe given below as a starter then add your own personal touches. The hardest part of this recipe is cutting up all the vegetables. An easy way to do this is to use the slicing blade of a food processor or you could use a mandoline. Before shredding the cabbage you need to remove the core. Then remove some of the outer leaves as they tend to be limp. The inside leaves are crunchier and sweeter. You can use just all white cabbage, but personally I feel that the addition of red cabbage gives much more color to the dish. Shred the carrots and chop the onions and celery. Place all the vegetables into a large mixing bowl. 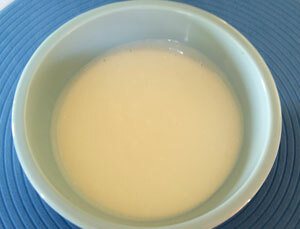 To make the salad dressing, place the sugar, lemon juice, white vinegar, sour cream and mayonnaise into a small bowl. Stir until the ingredients are well mixed. Toss the vegetables and slowly pour the dressing over the salad. Remember to toss the salad again before serving so that all the vegetables have an even coating of dressing. To serve spoon into a salad bowl and sprinkle over freshly ground black pepper. 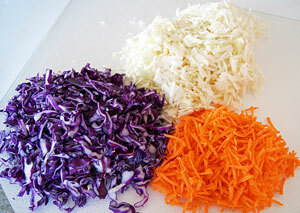 Omit the red cabbage and add red or green pepper for color. If you are short of time and don’t wish to make the recipe from scratch, then buy the pre-packed shredded coleslaw vegetables and simply add our tasty dressing. But remember, to ensure freshness, buy the salad mix as close as possible to the day of serving. Because the vegetables soften once dressed, add the dressing just before serving.